The English Standard Version Bible captures as far as possible the precise wording of the original biblical text and the personal style of each Bible writer, while taking into account differences of grammar, syntax, and idiom between current literary English and the original languages. The ESV thus provides an accurate rendering of the original texts that is in readable, high quality English prose and poetry. This Bible has been growing in popularity among students in biblical studies, mainline Christian scholars and clergy, and Evangelical Christians of all denominations. Along with that growth comes the need for the books of the Apocrypha to be included in ESV Bibles, both for denominations that use those books in liturgical readings and for students who need them for historical purposes. More Evangelicals are also beginning to be interested in the Apocrypha, even though they don’t consider it God’s Word. 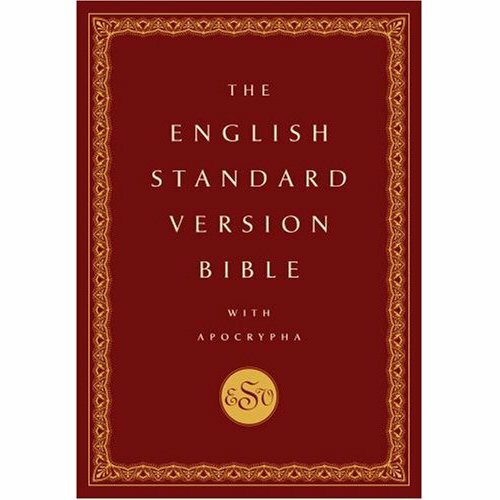 The English Standard Version Bible with the Apocrypha , for which the Apocrypha has been commissioned by Oxford University Press, employs the same methods and guidelines used by the original translators of the ESV, to produce for the first time an ESV Apocrypha. This will be the only ESV with Apocrypha available anywhere, and it includes all of the books and parts of books in the Protestant Apocrypha, the Catholic Old Testament, and the Old Testament as used in Orthodox Christian churches. It will have a lovely pre-printed case binding, and will include a full-color map section, a table of weights and measures used in the Bible, and many other attractive features. The English Standard Version Bible with Apocrypha is certain to become the preferred Bible in more conservative divinity schools and seminaries, where the Apocrypha is studied from an academic perspective. And it answers the need of conservative Christians in general for a more literal version of these books. List price is $25.00. Amazon.com is selling it for $16.50.